Replacing the front brake pads and rotors on a first generation Lincoln Mark VIII is so easy, it should be criminal allowing a dealer to do it for you. This is something that anyone can do. It takes about an hour to do both front brakes. This “How To” explains how to change both pads and rotors. You don’t have to change the rotors, but with low cost rotors such as these, I always figure I might as well change them and have new rotors. This is personal preference on my part. You can have the rotors turned at a brake shop and replace the original ones if you prefer. Important: Brake pads should always be replaced in pairs. You can get the parts cheaper from places like Pep Boys or AutoZone, but I recommend using OEM – In my opinion, you don’t really know the quality of some of the products these kind of stores sell, and often the products are built on cost specifications first, rather then quality specifications first. 1. Turn off the air ride suspension switch, located in the truck on driver’s side. This is very important and failing to do so could damage your suspension! 2. Set parking brake and chock one or both rear wheels. 4. Lift the front of the car with a floor jack positioned on the motor cross member at the center. If you do not have a floor jack, use the car’s trunk jack and jack up each side as shown in the owner’s manual. The wheels MUST clear the deck. Use a jack stand to support the car on each side at the motor cross member. IT IS EXTREMELY DANGEROUS TO ALLOW THE CAR’S WEIGHT TO BE SUPPORTED ONLY WITH JACKS. – BE SURE TO USE STANDS! 5. Remove the wheel lug nuts the rest of the way. 6. Remove each front wheel and position it under the car’s frame, just behind the front fender opening. If a jack stand gives way, the weight of the car will fall on the tire, not on your foot or leg. You might lose a tire, but you will keep your leg. 7. Now, inspect the brake system. Look for leaks, cracking lines, or anything that looks like its going to fail soon. I had no such problems. 8. 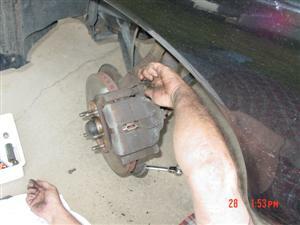 Remove the two bolts on the rear of the caliper assembly, and remove the caliper assembly. 9. Remove the old pads. Raise the hood and open the cap on the brake fluid reservior so as to relieve the fluid pressure. Now place your caliper compression tool into the caliper using one of the old brake pads as a brace and compress the caliper. This is done to make room for the new, thicker pads. I like to now tie the caliper assembly to a part of the suspension to keep pressure off of the brake lines. 12. Place your new brake pads in place in the cradle and then replace the caliper over them securing the caliper in the proper position. (this is only necessary in the 1993 – 1996 models, 1997 – 1998 models have a one piece assembly and you have to place the pads in the caliper as you slide the caliper down onto the rotor) Remove the rope you used to tie the caliper up. 13. Replace the original 2 bolts on the rear of the caliper. Spray the entire assembly with brake cleaner wiping any excess cleaner away. 14. Replace the wheels. Be sure to torque your lug nuts evenly. Use a quality torque wrench. NEVER use an impact wrench to tighten your wheels. If you have a shop do it, INSIST (you may have to watch them) that they use only hand pressure to snug then a torque wrench to tighten the lug nuts. For aluminum wheels, you need to tighten them to about 85-90 ft/lbs of torque. If you don’t evenly torque your wheels, you’re begging for warpage! Remove the jack stands and lower the car. Turn your air ride suspension back on. Close the cap on the brake fluid reservoir, adding fluid if necessary. Now season the new rotors. The proper procedure for ‘seasoning’ NEW rotors is to take the car up to about 25 MPH then slow down gently to about 5 MPH. Do this 4 or 5 times then park the car for a two or three hours until the rotors are back to ambient temperature completely. The reason for doing this is that it helps to align the molecules in the steel making the rotors stronger and less prone to warping. This is very important as it helps prevent warping your rotors. Note, if you’re doing front and rear rotors, install and season the fronts first, then install and season the rears. Go up another 10 MPH for the rears as they don’t get the braking force that the fronts get. Other than that, the procedure is the same. Be advised that you don’t have to do this when you replace the pads or even when you turn the discs, only when you put new rotors on the car. Also, if you put on new rotors, you should use new pads as well. Visit the Lincoln Mark VIII Forum for more help replacing your brakes! I wanted to note. One of the authors of this article, Jibit, aka David O’Donnell, (kneeling) passed away on Sept. 30, 2007 after a tragic motorcycle accident. Dave was one of the founders of LincolnvsCadillac.com and one of the best friends I have ever known. RIP my friend, you are missed. Mod your Gen 2 Ash Tray for a quick cell phone perch. Best way to LED your Door entry light.